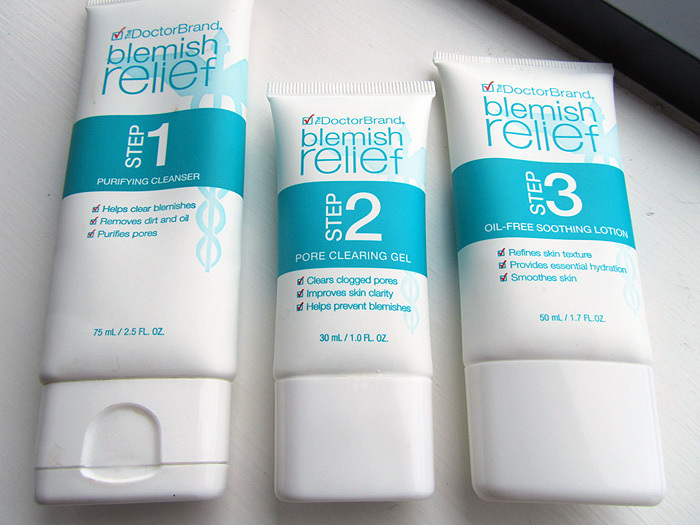 This week, Lucy from Miss Lucy Loves is bringing us her guest review on the Doctor Brand Blemish Relief Kit which promises to be a simple, comprehensive regimen to help treat and prevent acne and breakouts, take it away Lucy! 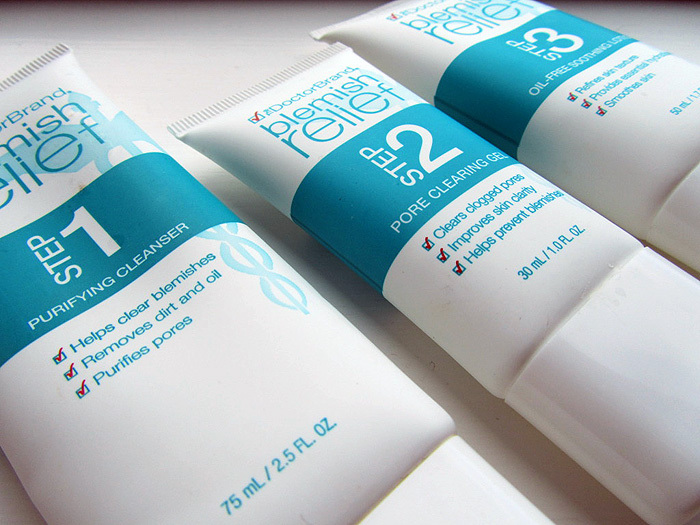 This three step system aims to reduce the appearance of blemishes within two weeks. Step 1 is a purifying cleanser, step 2: a pore-cleansing gel and step 3: an oil-free moisturiser. For someone who suffers from huge, hormonal under-the-skin spots, my skin is actually quite dry. I have a dry T-zone and normal cheeks with most of my painful blemishes clustering on my chin and around my mouth. As a result of my dry skin, I usually use a heavy duty moisturiser such as Oilatum and have to say that after about a week I had to stop using step 3 of the Doctor Brand Blemish Relief Kit as the oil-free moisturiser just wasn’t cutting it on my dry areas. The cleanser is a joy to use, it lathers nicely with a little water and leaves the face fresh and tingly. The scent is similar to those Clearasil face pads I used to use as a teenager; clinical but reassuring. Step 2, the pore-cleansing gel, is also great. It stings slightly on any open blemishes which, again, I find reassuring as it feels like it is actually doing something. I’ve been using the system now for nearly a month and am amazed at the results. Yes, I still have blemishes but they are completely different in their nature. I do still get huge under-the-skin lumps form, but they quickly disappear, never reaching the surface. Instead of these huge ones, I tend to get smaller white heads which (naughty, I know) I just pop and then they vanish much more quickly. I’ve now finished my tube of the cleanser and have already been out to buy a second tube. I will also repurchase the cleansing gel but not the moisturiser. The moisturiser would be great for someone with oily skin though. At £19.95 from Boots for the set, it isn’t a cheap option but I genuinely think it is so effective that it is worth paying for. I don’t have dry skin, myself, so that moisturizer may be in the cards.